After living in this Philly for the last few months, I always find myself wanting to explore Center City and all of the food it has to offer. When I do get the chance to go downtown, I often find myself going back to Reading Terminal Market. From their produce shops to amazing restaurants, I have not once had a bad meal there. The problem is that for as much as I plan out the many restaurants I want to eat at, I can never make it to all of them. 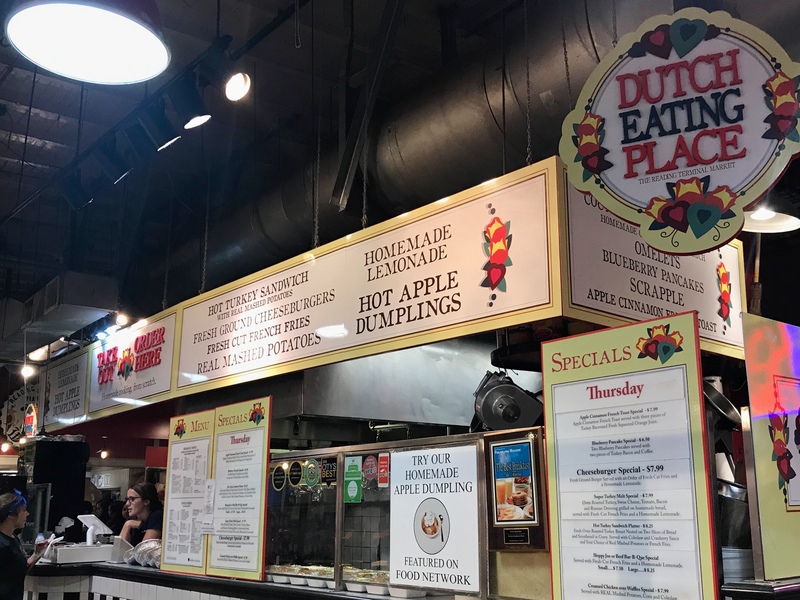 I decided to scope out the best brunch places that this market has to offer and share my guide to living it up at brunch at Reading Terminal Market. First stop I went to: Dutch Eating Place. This is one of the Market’s most classic eateries and offers breakfast, lunch, and dessert. 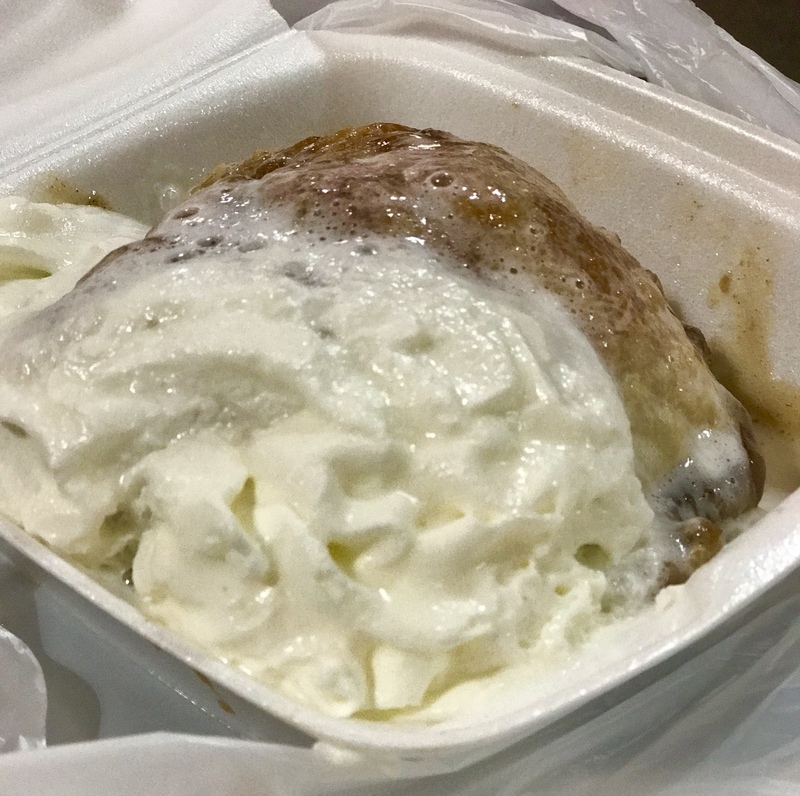 I decided to order a fan-favorite dish that was also featured on Food Network: the hot apple dumpling. While this may be a dessert, my friend and I started our brunch with this dish. While it’s not a classic brunch item, I think it goes with any meal. This dumpling is like a rolled up apple pie with a flaky crust and perfect apple to sugar ratio. While the whipped cream might have melted, it was a great creamy addition. Next stop: Beiler’s Bakery. 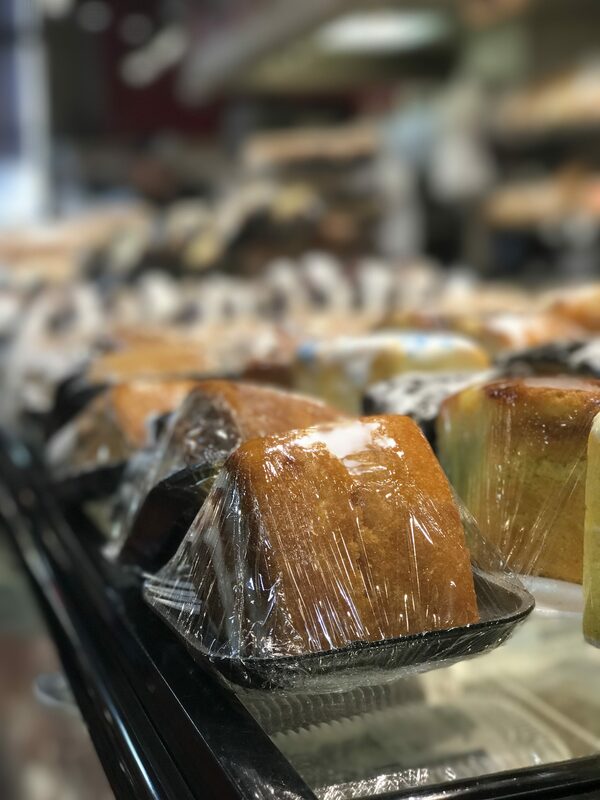 This bakery has it all: donuts, muffins, breads, cookies, cakes, whoopie pies, the list goes on… One of my favorite parts about this bakery is that it also offers gluten free baked goods! I had some gluten free monster cookies and apple bread. I have often found it difficult to find good gluten-free baked goods in store, but these have to be some of my favorite because the food is not too dense and doesn’t lose any of the flavor of regular baked goods. (If you’re gluten-free, you know what I’m talking about). My friend also got the peanut butter cookies that are basically a cookie shell with peanut butter inside. 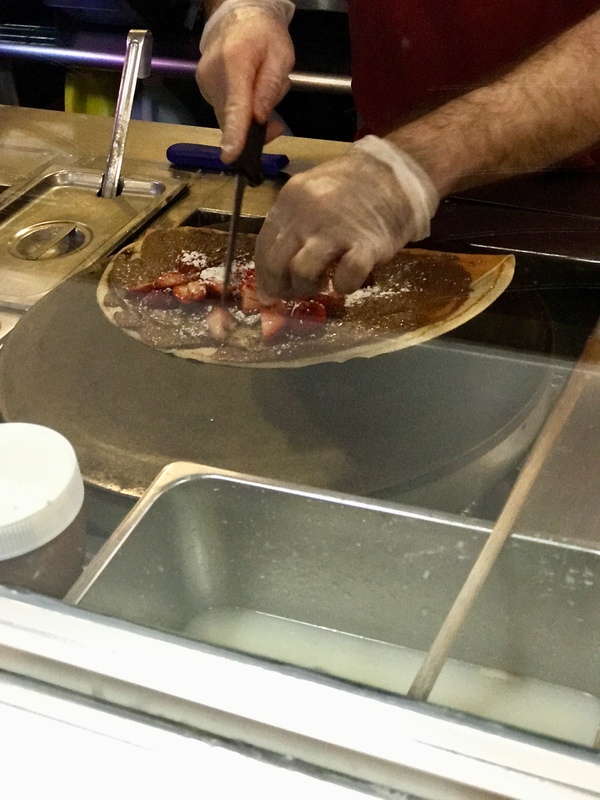 My friend decided to order a strawberry Nutella crepe from Profi’s Creperie, which was absolutely delicious. The crepe was light and airy, and you can’t go wrong with Nutella. 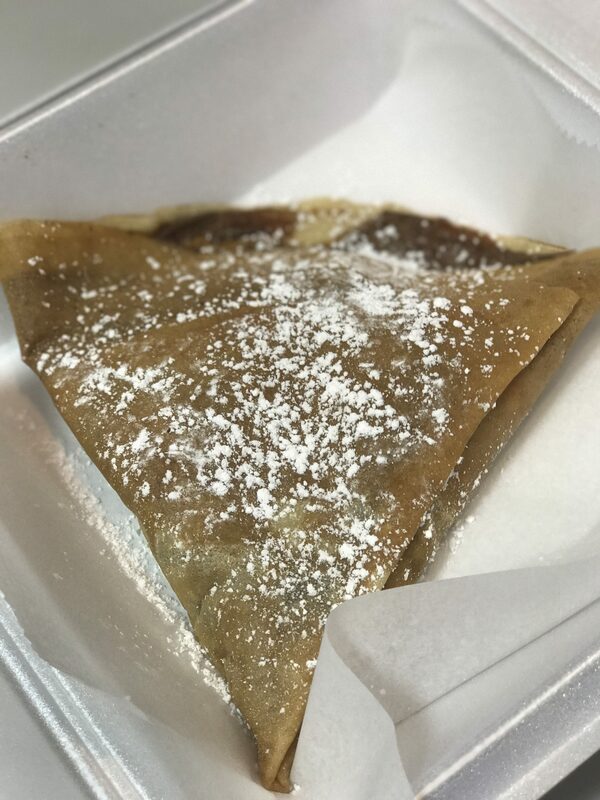 This Creperie offers a variety of sweet and savory dishes to satisfy your crepe needs. Also, you get to watch the shop make your crepe before they slide it across the counter to you. Our final destination: Down Home Diner. This restaurant is your traditional diner but set in the hustle and bustle of Reading Terminal Market. It serves comfort food and the best thing of all, breakfast all day! One thing to note is that Down Home is one of the only places in Reading Terminal Market that does not close at 6pm most days, so you can even get a stack of pancakes here at 8 at night. I had the oatmeal pancakes – these pancakes are naturally gluten-free which is a big plus for me. While these pancakes were sweet enough, I couldn’t resist adding chocolate chips in. I’m not sure if it was all the other food I had already eaten, but these pancakes were really filling. 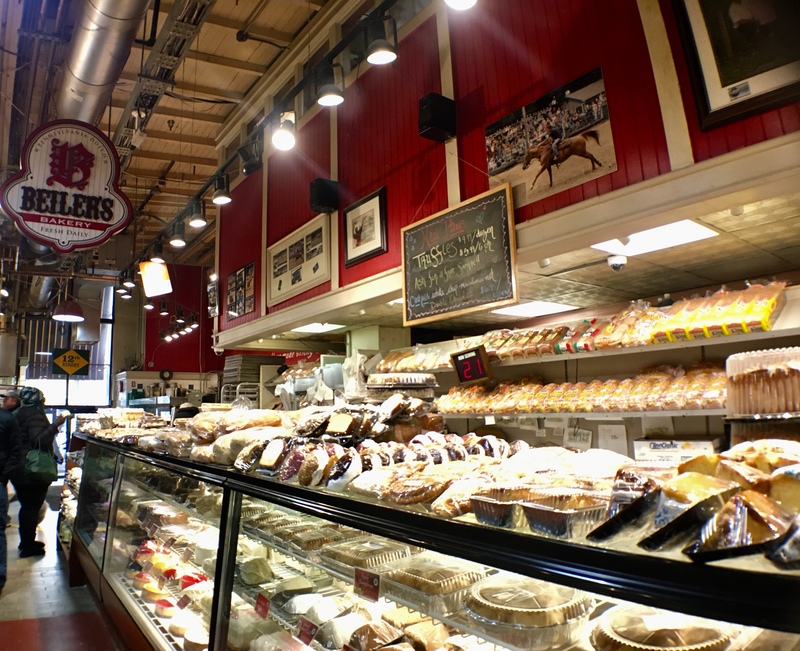 Well there you have it: some of my favorite brunch spots at Reading Terminal Market! It’s a great place to sit down and have a big meal, or even to hop around and try different brunch foods.